Karen Campbell is a cultural correspondent and dance critic for the Boston Globe and a freelance writer/editor in the arts, travel, health, food, and education. She also creates press/marketing campaigns, with materials created for the Boston Symphony Orchestra and Emmanuel Music, among others. As founder and co-coordinator of the outreach organization Brookline Parent Education Network (www.B-PEN.org), she creates publications and presentations on parenting-related issues. She also is the author of two books on veterinary medicine. She can be reached at karencampbell4@rcn.com. Boston Ballet in rehearsal with William Forsythe. Liza Voll, Courtesy Boston Ballet. In 2016, Boston Ballet officially brought William Forsythe back to the U.S. after the revolutionary choreographer's four-decade European career. A five-year partnership with the company promises that Forsythe will add at least one piece to its repertoire each year, and it gives him an American home base for creating new work. Boston Ballet's Full on Forsythe program, March 7–17, features the world premiere of Playlist (EP), his first new ballet for an American company in more than two decades, as well as Pas/Parts 2018 and the North American premiere of Blake Works I.
Haley Schwan. Photo by Brooke Trisolini, Courtesy Boston Ballet. Haley Schwan's artistic journey toward becoming a Boston Ballet company artist has been anything but ordinary. From the Vaganova Ballet Academy and Staatsballett Berlin to immersive theater in New York City and choreographing for the MTV Video Music Awards, Schwan has had some unusual detours. But the 26-year-old with a warm demeanor and quick smile seems to be enjoying the ride. As a child, Schwan studied gymnastics, jazz, tap and contemporary dance in her native Michigan, before turning her focus to ballet. After a summer intensive at the Kirov Academy of Ballet at age 12, Schwan began studying there full-time until age 16, when she was invited to the Vaganova Ballet Academy in St. Petersburg, Russia. María Álvarez in John Cranko's Romeo & Juliet. Photo by Liza Voll, Courtesy Boston Ballet. In Boston Ballet's production of La Sylphide last spring, María Álvarez just about stole the show as Madge. With a conniving gleam in her eye and a grim, angular hitch in her step, she exuded a dramatic, malevolent energy and taut physicality that made the role totally her own. She credits renowned Royal Danish Ballet character artist Sorella Englund's coaching with helping her find the witch's inner torment. "She built the character in me, then gave me the freedom to make Madge alive," says Álvarez. Hannah Bettes. Photo by Jayme Thornton for Pointe. 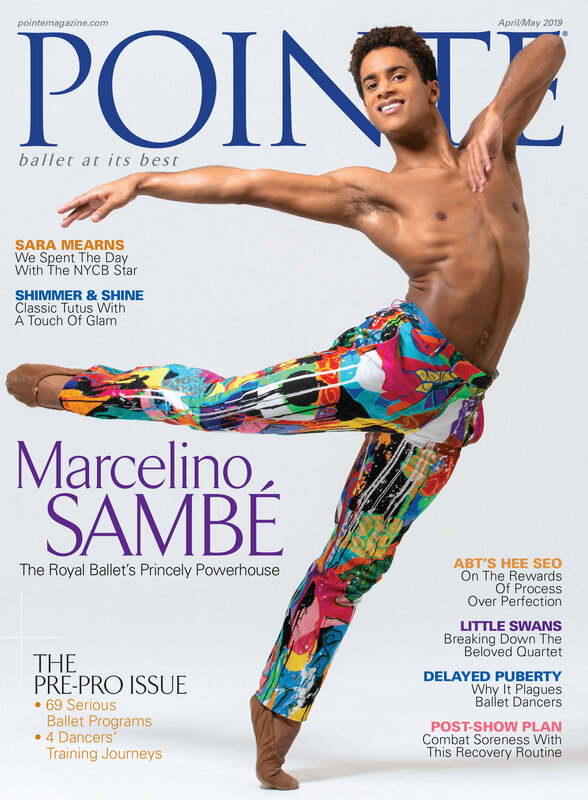 This is Pointe's October/November 2018 Cover Story. You can subscribe to the magazine here, or click here to purchase this issue. Hannah Bettes has had a very big year. The Boston Ballet second soloist was nominated for a Princess Grace Award, and she made her debut in three major classical roles—Sugar Plum Fairy in The Nutcracker, Effie in La Sylphide and Aurora in The Sleeping Beauty, her most challenging classical role to date. "You're carrying a full-length ballet, and you have to have the stamina and stay composed and in character, even if you're dying!" Bettes says. When Bettes, 22, made her professional debut with Boston Ballet four years ago, she was already a highly recognized teen in the competition world, bringing with her a raft of prizes. But she also brought stylistic versatility and a palpable hunger to learn. While she possesses the quintessentially elegant classical line—high extensions, dazzling turns and slender feet that curve into perfect crescent moons—Bettes can easily skew off-center to sidle into the slinky undulations or sharp slices of Boston Ballet's contemporary repertoire. The wide-ranging rep is one of the aspects of the company she likes best. "Having to keep switching your approach keeps things interesting. Technically, I've been able to progress faster."